Are you totally smitten with your Labradoodle? Of course you are. You want to give it the best care possible. But how? Thousands of Doodle-owners all around the world ask the same question and want honest, no-nonsense answers. Internationally known Doodle-groomer Wanda Klomp is the perfect person to help you. She will teach you how to brush, detangle and de-mat your Doodle’s coat, and how to prevent coat problems. You will learn step-by-step how to groom your Doodle in a natural way. Between the covers of this book is everything you need to know to take the well-being of your Doodle into your own hands and improve its health, including information about food, diseases and allergies. In doing so you will become your Doodle’s true leader and build a strong relationship based on mutual trust and teamwork. I wrote this book to make an expert out of every Doodle owner. This book will teach every Doodle parent how to keep their fur-babies’ coats healthy, shiny, cuddly and free of tangles. I write about shedding, the hair growth cycle and explain what tangles are: how they arise and how to remove them, but most importantly, how to prevent them. I go into detail on how to trim and shape their dogs’ hair themselves, so they will always have that "no-grooming," natural look. And even if you own a different breed with a similar tangle sensitive coat, you will be able to use the techniques in this book to help your dog lead a more comfortable life. Since Doodle comfort and Doodle ownership go far beyond grooming, starting with Chapter 9 I teach things that every dog owner should know no matter what kind of dog they have. But specifically, everything they need to take the well-being of their Doodles into their own hands. My goal is nothing less than for both owners and dogs to live wonderful, fun-filled and healthy lives together. Don’t be alarmed by what you’ve read so far; the next part of the book will teach you all the ins and outs of basic and advanced grooming. This involves a lot more that you would have thought but I will hold your hand and take you through it all step by step. In no time you will learn how to literally take the well-being of your Doodle into your own hands. Are you ready? Good. Then let’s begin. 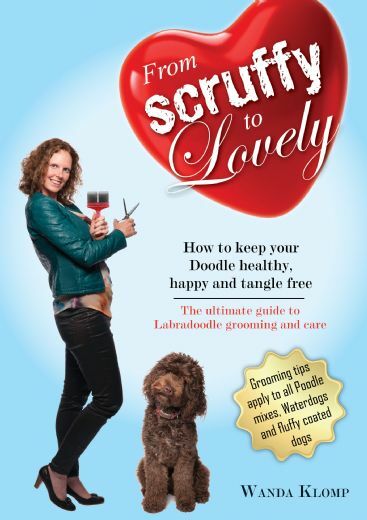 Wanda Klomp is a life coach and specialized Labradoodle groomer in the Netherlands. As the daughter of a groomer and breeder of Waterdogs, she grew up among dogs with fluffy, high maintenance coats. With grooming in her blood, communicating with dogs as her second nature, her coaching skills and passion for making people self reliant, she developed unique Labradoodle grooming workshops to teach owners to groom their Doodle in a natural, fluffy way, helping them take the well-being of their pup in to their own hands and strengthen the relationship with their Doodle.